Royce O'Neale is an American professional basketball player who plays in the National Basketball Association (NBA). As of 2018, Royce O'Neale currently plays for the Utah Jazz as their Small forward. Royce O'Neale has also played for other teams in past. As a small forward, Royce O'Neale reportedly earns around $1,378,242 as his yearly salary from Utah Jazz. Further, the NBA player has an estimated net worth of over $1 million. Royce Khalil O'Neale was born on June 5, 1993, in Killeen, Texas, United States to parents Deborah Kingwood. As per his nationality, he is American and belongs to African-American ethnic group. Further, his star sign is Gemini. He grew up along with his sister, Dana. Royce O'Neale attended Harker Heights High School in Harker Heights, Texas and started playing for his high school basketball team. After high school graduation, Royce enrolled at the University of Denver where he played in the college team for two seasons and later transferred to Baylor University. After not being selected in the 2015 NBA draft, he played for a professional basketball club, MHP Riesen Ludwigsburg that is based in Ludwigsburg, Germany. Later in season 2016-2017, he signed with the Spanish club, Herbalife Gran Canaria and also joined a Lithuanian club, Zalgiris Kaunas. Royce was signed to Utah Jazz after playing for the team in 2017 NBA summer league and made his debut on October 21, 2017. 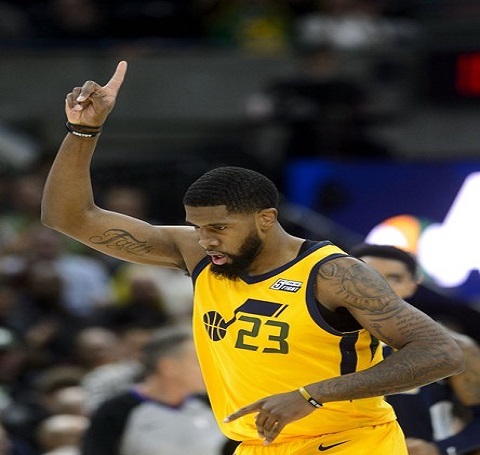 In a home game against the Phoenix Suns on February 14, 2018, Utah Jazz won by 107-97 he scored a career-high 19 points. While the players like Derrick Favors, Donovan Mitchell, and Joe Crowder also scored the winning point. As of 2018, Royce O'neale has an estimated net worth of over $1 million. He reportedly signed with Utah Jazz and has an average salary of $1,378,242 annually. Royce is a 15th most paid player this year and Rudy Gobert is the highest paid player of the team. O'Neale so far has made earnings of $2,193,857 from his entire NBA career. Kept aside O'neale financial earnings, his personal assets include a big budget Home and a desired fast car. Further, the NBA Player also earns a good amount of money from various sponsorships. Royce Khalil O'Neale has kept his personal life out of the spotlight. The information about his dating life is still not disclosed. According to the information given to the media, he is currently single and more focused on his work. Royce has posted a picture of his mother and niece on Instagram. His father is not known. Other than being a famous NBA basketball player, Royce has also gained equal fame in social media with a numerous follower of 18.9K on Twitter and 58K on Official Instagram account. Royce is not only a world-class athlete but also has a very attractive individual. The Famous NBA star measures 6 feet 6 inch / 1.98 m and weighs around 226 lbs / 103 kg.